Not Gonna Lie: We Miss You Molly! Speaking of Witch, Which Witches Are They? 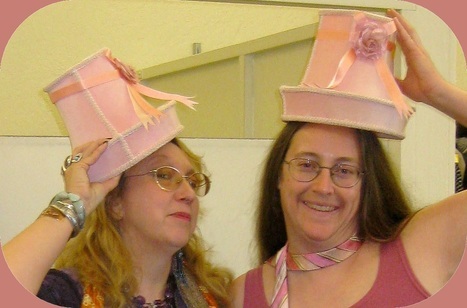 Molly Blue Dawn & Lorelei Moon, Queens of the Pleasant Hill Goodwill. *Photo taken by that interesting lady we met in line because the clerk with the antlers on his head was busy. Note the pink stripey tie Molly has draped around her neck because pink stripey ties draped around the neck are cool! Molly Blue Dawn & Lorelei Moon are lovers of magic, laughter and adventure! Co-conspirators in magical practice and creative rituals, they can frequently be found in Molly's hybrid "James" taking spontaneous excursions around the Bay Area in Northern California. One of the things Lorelei noticed soon after meeting Molly is that no matter who the passengers might be, the most interesting, thought provoking and often hilarious conversations happen in Molly's car, and she has long hoped for a chance to create a podcast from the content! For some time the idea of a podcast, website and/or You Tube Channel has been percolating! One night during an idea-avalanche, trying to come up with a name for a home site for Molly's Tarot Practice, Lorelei brought up a project name she had been brewing for some time, Speaking of Witch. Molly is wizard when it comes to naming things. Her tarot business name became Fortune's Fool. Molly loved the SOW idea. Lorelei had been worried because she had not bought the domain yet.The availability of such a perfect play on words seemed unlikely. Surely someone must have already thought of it! With Molly's encouragement, Lorelei checked as soon as she got home that night and found to her delight that speakingofwitch.com was available. She snapped it up. It's another example of her mantra, "Perfect Timing!" She will always be grateful for Molly's enthusiasm and encouragement! 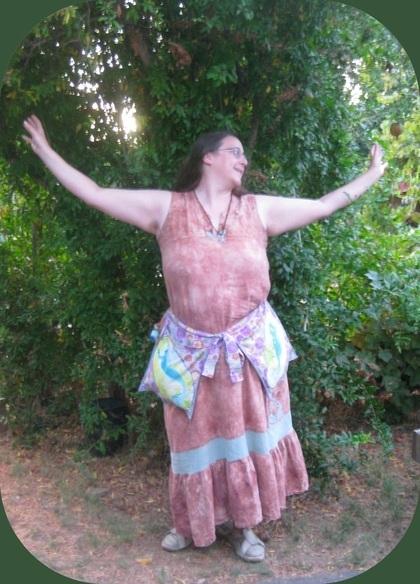 A founding member of CAYA, (Come as you are Coven), Wishbringer Molly Blue Dawn, High Priestess of Serendipity, is a fountain of brilliant ideas, source of spontaneous magical inspiration and connaisseuse of delight! Molly is an avid explorer, always ready to meet new people and try new things which has given her an arsenal of anecdotes and funny stories that relate to pretty much any situation. She is inspired by many things; You Tube, children's stories, cemeteries, the wind's whisper, and Laughter Yoga! An anthropologist with a background in ritual theater, this Bay Area native witch is a valuable asset to several local Pagan organizations and produces a blog, The Wishbringer, of weekly local events and also regular entries on "permission to be your best, most joyous self!" Molly is an inspired reader using the Shadowscapes Tarot .